Evidence for the involvement of inflammatory processes in the pathogenesis of Alzheimer's disease (AD) has been documented for a long time. However, the inflammation hypothesis in relation to AD pathology has emerged relatively recently. Even in this hypothesis, the inflammatory reaction is still considered to be a downstream effect of the accumulated proteins (amyloid beta (Aβ) and tau). This review aims to highlight the importance of the immune processes involved in AD pathogenesis based on the outcomes of the two major inflammation-relevant treatment strategies against AD developed and tested to date in animal studies and human clinical trials - the use of anti-inflammatory drugs and immunisation against Aβ. 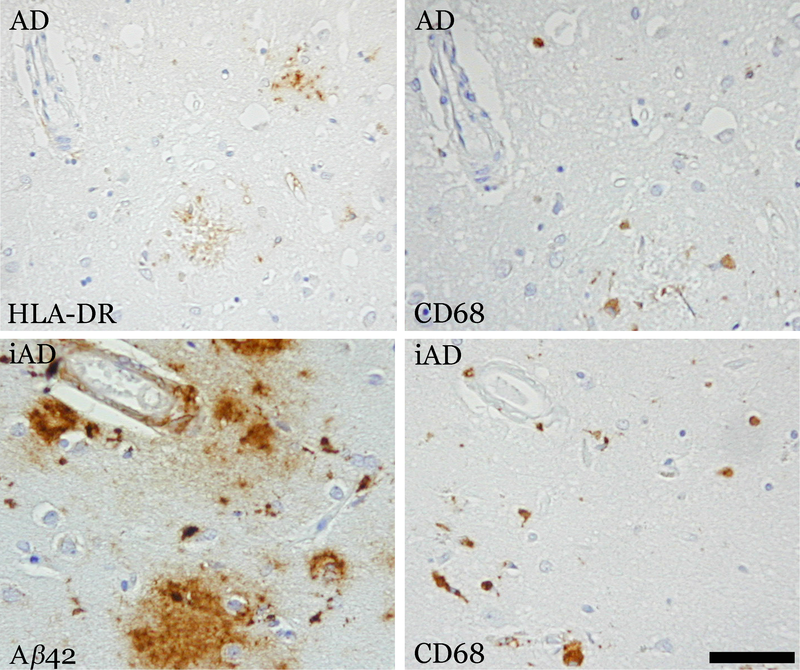 In addition to amyloid beta (Aβ) and tau protein aggregates, the presence of immune-related antigens and cells around amyloid plaques in the brains of patients with Alzheimer's disease (AD) has been reported since the 1980s [1–3]. These initial observations brought about changes to the previously assumed view of the brain as an immunologically isolated organ. In the 1990s, additional findings of activated complement factors, cytokines and a wide range of related receptors in the brain of AD patients led to the concept of neuroinflammation (inflammation within the central nervous system (CNS)), which suggests that immunological processes in the brain are likely to be involved in the pathology of degenerative diseases of the CNS. Table 1 lists signs of an altered immune response reported in AD patients. Aβ, amyloid beta; AD, Alzheimer's disease; IFN, interferon; NFT, neurofibrillary tangle. The role of aggregated proteins in the pathology of AD had to be re-considered to account for these observations. The inflammation hypothesis emerged relatively recently, when it became clear that the observations of altered immune processes in AD could not be ignored. Neuroinflammation is still considered to be a downstream consequence in the amyloid hypothesis, with Aβ amyloid within the CNS bringing about activation of microglia, initiating a pro-inflammatory cascade that results in the release of potentially neurotoxic substances, including cytokines, chemokines, reactive oxygen and nitrogen species, and various proteolytic enzymes, leading to degenerative changes in neurons [4–7]. It has also been suggested that activation of microglia may lead to phosphorylation of tau and formation of neurofibrillary tangles (NFTs) [8–10]. However, the exact role of inflammation in the pathology of AD and its mechanisms in terms of the cells involved - microglia, astrocytes and T lymphocytes - are still debated. The inflammation hypothesis is also supported by epidemiological retrospective observations that patients with rheumatoid disease who are on long-term anti-inflammatory therapy have a lower prevalence of AD [11–15]. Other largely observational studies have also supported the concept that anti-inflammatory approaches may be protective against the development of AD [16, 17]. Furthermore, transgenic animal studies and human trials have demonstrated that treatment with nitric oxide-releasing non-steroidal anti-inflammatory drugs (NSAIDs) can reduce and/or prevent the AD pathology (reviewed by McGeer and McGeer ). It has also been shown that a certain drug with anti-inflammatory properties (CNI-1493) suppresses amyloid pathology and improves memory performance in transgenic mice . Despite these findings, however, several prospective anti-inflammatory strategies against disease progression in subjects with established AD have failed to show convincingly positive results (see the 'Current treatment strategies based on the inflammation hypothesis' section below). Although these effects did not reach significant levels in large human cohorts , interest in the inflammatory processes of AD pathology has persisted [21, 22]. One particularly interesting aspect of these studies was that (at least in animal models) the observed beneficial action of anti-inflammatory drugs was not necessarily attributed to down-regulation of inflammatory processes. Instead, activation of microglia via a route that enhances its phagocytic activity against Aβ was suggested . The inflammation hypothesis also suggests another approach to sporadic AD and associated risk factors for investigation - polymorphism of genes related to induction and regulation of inflammatory processes. Initial studies suggested a role for specific cytokine polymorphisms - for example, in the genes encoding IL-1 and TNFa [24, 25] - with evidence that IL-1 polymorphism may be associated with differing degrees of microglial activation in AD . However, a meta-analysis of genetic influences in AD has not supported the initial findings of cytokine gene variation as a risk factor for AD, but has instead emphasised the over-riding importance of the APOE gene polymorphism as the major genetic risk factor . Although many mechanisms for the role of apolipoprotein E (APOE) in AD pathogenesis have been suggested , the key mechanism remains unclear. Of particular interest to the inflammation hypothesis is the finding that APOE e4 carriers with AD have more marked microglial activation . Research into the role of inflammation in AD is driven by questions similar to those posed for Aβ and abnormal tau accumulation. Can neuroinflammation be the cause of AD? Are the inflammatory processes in AD contributing to the disease pathology? Alternatively, are they merely the consequence of the disease, initiated and driven by the neurodegeneration? Does inflammation act as a harmless bystander in the disease course? Can the immune processes of the brain be harnessed to fight against the disease pathology? Inflammation as the sole cause of AD is usually considered as unlikely on the basis that peripheral systemic disorders rarely start with inflammation - there is an initial challenge that is required to stimulate an immune (or inflammatory) response . However, it should be noted that being a response to an insult rather than an insult itself, inflammation plays an important role in the reaction of an organism to this insult, with potentially damaging and sometimes fatal consequences (for example, in allergy). Autoimmune diseases can affect the CNS (for example, paraneoplastic syndromes, multiple sclerosis) but there is little evidence to suggest that AD falls into this category. With respect to whether inflammatory processes in AD contribute to the disease pathology, a lot of evidence has accumulated suggesting that inflammation can contribute to the AD process and exacerbate the course of the disease. It is still unclear exactly how inflammation acts on the diseased brain, as most of the observations about the mechanisms of its action are based on animal models. However, the supportive evidence for inflammation being a contributor to the disease process is as follows. First, the cognitive state of AD patients who also have short-term peripheral infection show signs of sudden decline in cognitive state, and rarely return to the previous level even after recovery from the infection . Second, community-based studies suggest that plasma levels of inflammatory proteins, including cytokines, are increased before clinical onset of dementia, including AD , which may be exacerbated by the presence of atherosclerosis . Third, observed signs of inflammation in the brain of AD patients are comparable to those seen in peripheral inflammatory reactions and are likely to have a strong cytotoxic effect on neurons [5, 30]. Fourth, signs of inflammation are particularly localised in the brain areas affected by AD pathology and co-localise with plaques and tau deposits [1, 2, 34–40]. Fifth, high pathology controls (individuals who have Aβ and tau aggregates at levels similar to AD patients, but do not develop dementia) show lower signs of inflammation . Sixth, Mini Mental State Examination scores of AD patients correlate with the level of cortical microglial activation as observed from in vivo imaging studies . From these observations, inflammation could contribute to the course of AD in two ways. Firstly, as an initial innate immune response to the changes in the AD brain. In the periphery, the innate immune system generates a non-specific response to an invading pathogen or a cell stress stimulus as a general first-line defence mechanism. Inflammation is part of this response, involving signalling via cytokines and via activation of the complement system to recruit the immune cells to the site of stress. In the periphery, this response is also often referred to as an acute, strong, but short-lived immune reaction. In the context of AD, association of microglia - the immune system cells of the CNS - with plaques and NFTs has been observed, suggesting involvement of innate immunity in the reaction to the AD-related stimuli. Observations of acute-phase inflammatory proteins alongside cytokines and chemokines associated with plaques and tangles in AD have been reported, suggestive of multiple ways of interaction between these inflammatory mediators . The presence of elements of the complement system and membrane attack complex C5b-9, in particular, has been reported to correlate highly with the level of synaptic loss . This engagement of the complement system has not been observed in the brains of high pathology controls, contributing to evidence of the involvement of acute mediators in AD. The C5b-9 complex is known to be very potent at killing or damaging neurons through signalling for production of various cytokines and other complement elements . However, most studies refer to inflammation in AD as weak and non-specific. This is explained on the basis of the presence of multiple mechanisms that regulate inflammatory reactions within the brain and minimise them . Nevertheless, long exposure to ongoing inflammation signalling, even at low levels, can bring about gradual neurodegeneration that might be more difficult to stop or reverse than acute inflammatory episodes observed in peripheral disorders . Secondly, the low-level ongoing inflammation in AD contributing to the course of the disease can be a sign of impaired adaptive immune responses leading to chronic inflammation. In the periphery, an innate immune response is followed by a switch to an adaptive response with generation of antibodies and overall down-regulation of acute pro-inflammatory signalling. The functions of the adaptive immune response include induction of more specific and stronger defence mechanisms against abnormal stimuli, and engagement of memory T cells that can recognise and eliminate the same stimulus more quickly and efficiently if it is encountered again in the future. The important feature of this type of response is to be able to recognise 'non-self' antigens and distinguish them from 'self'. In the context of AD pathology, Aβ plaques and NFTs persist, accompanied by ongoing inflammation over a long period of time, during which the disease progresses. It is suggested, therefore, that after induction of the initial immune response, when plaques and tangles are recognised as invading stimuli, transition to the adaptive immune response and the mechanism of recognition of plaques and tangles as persisting stress stimuli is impaired. With respect to microglia in AD, this effect is reflected by their inability to transit from an initial classic state (also referred to as pro-inflammatory or Th1-induced) to an alternative (anti-inflammatory or Th2-induced) immune response. Impaired activation of microglial Toll-like receptors in AD brain has also been suggested [44–46]. The result is that phagocytic activity as well as the neuroprotective function of microglia are impaired . The type of inflammation in the AD brain is not well defined and is often blamed on 'dysfunctional' or 'malactivated' microglia . The exact profile of these microglia has not yet been well characterised , but the description is often based on observation of a single marker or a dystrophic and apoptotic appearance of the cells [48–50]. Some studies report the presence of auto-antibodies against Aβ in older people , and possible involvement of T and B cells in the AD process [52, 53]. However, conclusive positive evidence for direct involvement of antibody-mediated response in AD has not yet been presented . One could also suggest that inflammation observed in the brains of AD patients is merely a consequence of the disease, pointing to an inability of microglia to clear ever-growing neuronal debris due to extensive neurodegeneration and synaptic loss. Impaired recruitment of monocytes from the periphery to the site of the disease in AD brain has been suggested in this respect and demonstrated using animal models [54–56]. The phagocytic profile of microglia that is often referred to in AD brain is generally non-aggressive, aiming at clearing the damage/debris with minimal further damage to the surrounding tissue, leading to the question: can inflammatory activity in AD brain have a neutral or even beneficial role? However, another perspective comes from studies using a model of neurodegeneration - the ME7 mouse model of prion disease . These studies suggest that microglia in the context of a neurodegenerative disease, although generally in an anti-inflammatory state, are 'primed' to switch quickly into an aggressive profile should the opportunity arise. Such an opportunity may be a peripheral infection, as demonstrated in this model . Mixed and often contradictory findings with respect to inflammation in AD indicate the complexity and multi-functional role of the immune system. It became apparent that inflammation in the CNS, as in the periphery, is a mixture of both destructive and rebuilding processes. The balance between these processes determines the overall integrity of the tissue or the whole organism . Therefore, inflammation should not be viewed as wholly detrimental or beneficial in AD. Understanding of the whole spectrum of the immune processes involved is necessary to find an optimal solution for the prevention or treatment of the disease. The possibility of harnessing immune processes to direct the system towards clearance of the disease features has become an actively researched topic of AD. Much AD research is now aimed at modulation of the immune system to direct it away from microglial activation that is pro-inflammatory (or malactivated) towards a more controlled productive and phagocytic antibody-mediated immune response . In summary, the pathological changes associated with AD as described above should not be considered in isolation. It is more likely that their cumulative action results in disruption of the normal work of the CNS through damage to neurotransmitter systems, neuronal dysfunction and death. Two main treatment approaches addressing inflammatory processes in AD, but from different perspectives, have been investigated so far. The use of anti-inflammatory drugs aims to down-regulate the inflammation in AD brain for a potential beneficial effect, whereas the immunotherapy approach aims to harness the immune system and direct it against the pathological features of the disease, mainly Aβ deposition. The advances in, and limitations of, both approaches are discussed below. As mentioned above, retrospective studies of patients who were on NSAIDs long-term showed that these patients had a lower prevalence of AD. These observations have generated interest in anti-inflammatory strategies for AD. The approach was tried in APPSW and APP-PS1 transgenic mouse models of AD using nitric oxide-releasing NSAIDs [23, 61]. Both studies showed that treatment with these drugs reduces and/or prevents AD pathology in the animals. The involvement of microglia was suggested, but the results were contradictory, reporting decreased microglial activation in the APPSW model  but surprisingly raised levels of activated microglia in the APP-PS1 model . An effect of NSAIDs in decreasing secretion of Aβ was observed in cultured cells . However, the mechanism of action of the NSAIDs is not understood. Epidemiological studies show various degrees (up to 50%) of beneficial effect from the use of NSAIDs on the onset of the disease and dementia, with increased duration of drug use having a positive effect by reducing the relative risk of AD [16, 17, 20]. However, the results from randomized controlled clinical trials did not show any beneficial effect (reviewed by McGeer and McGeer ). Conventional NSAIDs can also cause undesirable side-effects (for example, gastrointestinal ulceration) . Driven by the amyloid hypothesis and by observations of microglia surrounding plaques in AD, but being unable to clear the plaques in animal models of AD and in human post-mortem observations, the immunisation approach has emerged. The idea of modifying the immune system and directing it towards effective clearance of plaques has generated a lot of interest. In animal models, immunotherapy has been reported to prevent the formation of and to clear existing Aβ deposits, and to remove dystrophic neurites [63–75]. The first reported immunisation study used PDAPP trans-genic mice and synthetic human Aβ42 peptide as the antigen . The animals developed a high antibody response (titre 1:10,000). Complete prevention of amyloid and neuritic pathology was achieved in mice immunised at 6 weeks of age, and extensive plaque clearance was achieved in older mice immunised at 11 months of age. Older immunised animals also showed Aβ-containing cells with an activated microglial phenotype, suggestive of Fc receptor-mediated clearance of Aβ42. Significant reduction in neuritic pathology as well as reactive astrocytosis were also observed in the older immunised group when compared to untreated controls. This work was followed by similar studies using Tg2576 and TgCRND8 APP transgenic mice. Active immunization in these models showed various levels of plaque clearance (up to 50%), significant behavioural improvements in older animals, and prevention of cognitive deficit in a younger group [64, 66]. Administration of antibodies against Aβ (m266, 3D6, 10D5, PabAβ1-42) directly into the brain or via the periphery (passive immunisation) in PDAPP transgenic mice also showed findings similar to active immunisation with regard to reduction of AD-like pathology through clearance of Aβ plaques and improved memory and learning performance [65, 67, 69, 70]. In one study, however, memory deficits were reversed even without alteration to Aβ burden . These studies posed questions about possible mechanisms of plaque clearance. Amyloid-antibody complex interaction with microglial Fc receptors was suggested as one possible mechanism . A non-Fc-mediated mechanism of direct plaque destruction with F(ab')2 antibody fragments that lack the Fc component was also proposed . However, the role of Fc receptor-mediated phagocytosis in plaque clearance after immunotherapy was questioned when Aβ clearance was observed in actively immunised phagocytosis-deficient (FCR-/-) APP mice at levels similar to FcR non-deficient APP mice . Equally, the ability of F(ab')2 fragments to activate microglia and remove amyloid fibrils was questioned when another study showed that these fragments fail to activate microglia and are less effective than IgG antibodies at clearing plaques . A two-step mechanism of plaque removal using anti-Aβ antibodies was proposed: an initial rapid decrease in Aβ deposition 24 hours after antibody administration, followed by microglia-dependent removal 3 days after antibody injection . A 'sink' mechanism was also proposed in which monoclonal antibody to Aβ may attract Aβ across the blood-brain barrier from the brain into the periphery . Although these studies showed that immunisation with Aβ was successful in animals, the models used, however, did not reflect the full pathology of AD (that is, they lacked NFTs or substantial neurodegeneration despite Aβ deposition). It was not clear from these studies if generation of anti-Aβ antibodies and removal of amyloid would show improvement of cognition in humans. Safety issues were also highlighted with respect to the acceptable and effective levels of antibodies that can be used in animals versus humans, the preference of the active over passive immunisation approach, and the exact mechanism of action of the vaccine . The antibody levels in animals had to be quite high to reach the desired effect of Aβ removal. The concern was whether sufficiently high levels of anti-Aβ antibody can be safely produced in humans. A detailed mechanism of action initiated by the immunotherapy was also not established. Despite these concerns and unanswered questions, the immunisation approach progressed to human clinical trials (see the 'Human clinical trials' section below). Following the halting of the active immunisation phase IIa trial (conducted by Elan Pharmaceuticals) due to an inflammatory side-effect in a subset of patients, more recent animal immunisation studies have been focusing on induction of a controlled immune response to AD pathology that avoids strong pro-inflammatory reaction. A necessity for a model that would reflect the full pathology of the disease led to the generation of the triple transgenic mouse model (3 × Tg-AD), which shows Aβ deposition as well as tangle formation, synaptic degeneration and behavioural impairments [78, 79]. Recent immunisation studies using this model showed that intra-hippocampal administration of Aβ antibodies clears or prevents plaque formation as well as clears early phosphorylated tau . The same group further investigated the effect of active and passive Aβ immunisation and demonstrated the importance of clearing both soluble Aβ and soluble tau for the improvement of cognitive performance . The latest active immunisation animal study in the Tg2576 model aimed to show that using non-toxic, non-fibrillogenic forms of Aβ together with an adjuvant that promotes a humoral, rather than a cell-mediated, response is effective in removal of AD pathology without adverse inflammatory effects and microhaemorrhages . This study also confirmed that immunisation is more effective at early stages of the disease. The same group tested active immunisation with different Aβ species in young lemur primates in order to evaluate the antibody response and choose the most efficient peptide and adjuvant for further studies in old lemurs . Tau-specific immunisation in various models of tauopathies is also underway . Clinical trials testing the active immunisation approach against Aβ42 were set up by Elan Pharmaceuticals. The first multicentre randomised multiple-dose double-blind human trial (phase I) was designed to assess the antigenicity, safety and tolerability of the developed treatment, and was performed between April 2000 and June 2002. Eighty mild to moderate stage AD patients 85 years old or less were recruited in the south of the United Kingdom. Of the recruited patients, 64 received multiple doses of 50 or 225 μg of Aβ42 peptide in combination with the QS21 adjuvant (AN-1792), and 16 received adjuvant alone (placebo). Four injections were administered at weeks 0, 4, 12, and 24, with permission to administer additional injections at weeks 36, 48, 60 and 72. Patients were assessed every 2 to 3 weeks. At the end of the study, it was reported that the treatment was well tolerated. Approximately 25 to 50% of the patients who received the active treatment developed a positive immune response to AN-1792 . In June 2001, a further study was initiated with a larger patient sample (phase IIa); 375 patients were recruited in Europe and the USA, of which 300 were to receive multiple doses of 225 μg AN-1792. This trial was halted after several months as 18 patients developed aseptic meningoencephalitis . The clinical report from the phase IIa study showed that most of the patients who developed this inflammatory side-effect were considered as antibody responders with varied levels of IgG and measurable IgM levels in serum, although these levels had no obvious correlation with the incidence or severity of meningoencephalitis . The event was predominantly singular, but four patients had moderate or severe relapses. Most of the diagnosed cases presented with progressively increased confusion, headache, or lethargy. A high white blood cell count was detected in the cerebrospinal fluid (15 to 130 cells per μl) with no signs of viral or bacterial infection. Twelve patients recovered to baseline status, and six patients continued to decline cognitively after the event. Whilst a report on the 1-year clinical follow-up of a subset of 30 immunized AD patients from the phase IIa study suggested evidence of a reduced cognitive decline in patients who generated antibodies against β-amyloid , a 1-year follow-up of all patients showed no significant findings on clinical outcomes . Furthermore, long-term (5 year) clinical and neuropathological follow-up of patients from the phase I trial showed that despite an antibody response, no overall positive effect on cognition was observed - the decline was similar to control patients . In the whole cohort, there was no evidence of improved survival or of an improvement in the time to severe dementia. Neuropathological reports on patients from the phase I and IIa studies all reported similar findings [88–93]. A significant reduction in Aβ pathology was evident, as well as resolution of some tau features (dystrophic neurites). The remaining Aβ plaques showed dense core morphology and patchy distribution in the affected brain areas. No effect on NFTs was found. Most cases also reported signs of Aβ particles within microglia, suggesting immunisation-induced Aβ phagocytosis. A comparison between neuropathological and clinical data in eight of the immunised patients from the phase I study showed that the degree of plaque removal correlated with the mean antibody response attained during the treatment study period . However, these patients had severe end stage dementia before death, including those with virtually complete plaque removal, with the exception of one patient, who had died very shortly after their first immunisation dose (due to a cause unrelated to the immunisation treatment). The conclusion was that although immunisation with Aβ resulted in clearance of amyloid plaques in patients with AD, this clearance did not prevent progressive neurodegeneration. The initial Aβ immunisation clinical trials therefore had mixed results and the information obtained has been influencing the development of subsequent trials. Several clinical trials involving active and passive immunisation in AD are currently underway . These include early phase active immunisation studies aimed at the carboxyl terminus of Aβ (amino acids 1 to 6; Novartis), passive immunisation using antibodies against the amino terminus (amino acids 33 to 40; Pfizer) and the use of intravenous immunoglobulin (Baxter Bioscience). Later phase passive immunisation studies include the use of antibodies to the mid-region of Aβ (amino acids 13 to 28; Lilly) and to the amino terminus (Bapineuzumab; amino acids 1 to 5; Elan). The latter has now entered a large phase III clinical trial with initial findings in an earlier study suggesting a beneficial effect for subjects not carrying the APOE e4 allele. Research into the inflammation in AD so far has demonstrated the complexity of the mechanisms involved, which interact with each other in multiple ways. This web of interactions makes it difficult to isolate any particular inflammatory process, element or cell and pinpoint its individual role in the progress of the disease. Immunisation as one of the AD treatment approaches has led to an increased interest in the immune processes associated with this disease and highlighted their role in AD pathogenesis. The ability to modulate the immune system by active immunisation to generate anti-Aβ antibodies and stimulate clearance of amyloid plaques underlined the potentially beneficial effect that the immune system can have on the pathology of the disease. The inflammatory response side-effect developed by some immunised patients pointed to the complexity of the immune processes acting in the brain and their potential for harmful effects. Microglia, as the main representative of the immune system in the CNS, play an important role in both of these effects. Their mechanism of action in AD pathogenesis and in the context of Aβ immunisation is still not clear. This review aimed to highlight the necessity of approaching current and future research into AD from multiple directions, and the importance of addressing neuro-immune interactions involved in the whole course of the disease when devising potential treatment strategies. EZ, JARN, CH, and DB are funded by the Alzheimer's Research Trust (ART/PG2006/4).